Las Vegas New Year's: A snowstorm is coming to Sin City. New Year’s Eve Snowstorm Set to Paralyze…Las Vegas? 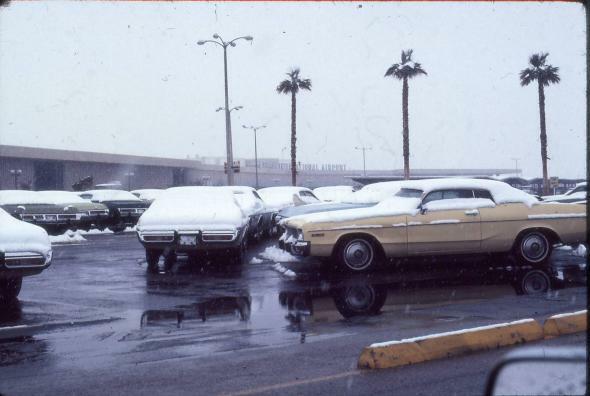 The last New Year’s snowstorm in Las Vegas occured in 1974. Frosty! It’s Barrow in the desert this week as “potentially historic” winter weather heads to Las Vegas on New Year’s Eve. Record-setting cold air and about an inch of snow are inbound for the normally balmy city, just as the party is peaking Wednesday night. Since Las Vegas weather records began in 1937, there’s never been measurable snow on New Year’s Eve, and just once on New Year’s Day (in 1974). But the city wasn’t nearly the party hub then that it is now. That means the storm could prove to be one of America’s most disruptive one-inch snowfalls of the last several years, alongside Atlanta’s commute-ageddon back in January. Besides Britney Spears and Lady Gaga, Vegas.com expects 300,000 revelers in town for the festivities. If the forecast pans out, expect treacherous “if not impossible” travel on Vegas-area roads, according to the National Weather Service—i.e. lots of drunk people driving in snow for possibly the first time. Las Vegas will have about the same weather as Anchorage this week, with both locations having highs in the 30s. As Alaska Dispatch News reports, this will be the first year in Anchorage weather history where the temperature has not dropped below zero, thanks to a persistent weather pattern that has effectively shipped its winter weather southward. As the snowy outlook materialized over the weekend, the on-duty forecaster at the National Weather Service in Las Vegas called it a “once-in-a-career” forecast. As of Tuesday morning, forecasters had backed off a bit on the totals, but still expect snow to stretch all the way back to the Los Angeles metro area. The juxtaposition of a particularly strong dome of cold high pressure over Wyoming and a low pressure system moving eastward from southern California will supply the record cold weather. If you’re planning to be in Vegas firsthand, to be on the safe side, the National Weather Service recommends sturdy shoes to avoid making a fool of yourself on the ice. Also, bring along a parka with the party dress, because it’ll take an awful lot of $18 gin and tonics to warm up in this kind of weather. It’s no surprise snow is a rarity in Las Vegas, one of the hottest and driest big cities in the country. It’s becoming even more so as the local climate warms. There’ve only ever been 15 snowstorms bringing more than an inch to Las Vegas, but just two since 1980. Monday ended the longest consecutive stretch of days without sub-freezing temperatures in Las Vegas history at 381. This week’s storm is a wintry exclamation point on an otherwise extremely warm and dry year in southern Nevada. Las Vegas is on pace for its warmest and one of its driest years on record. Only an inch and a half of rain has fallen so far this year, continuing an epic drought that has pushed nearby Lake Mead to its lowest levels since the Hoover Dam was built. The area water authority is rushing to complete a multimillion dollar tunneling project designed to speed up the lake’s depletion…err, access.